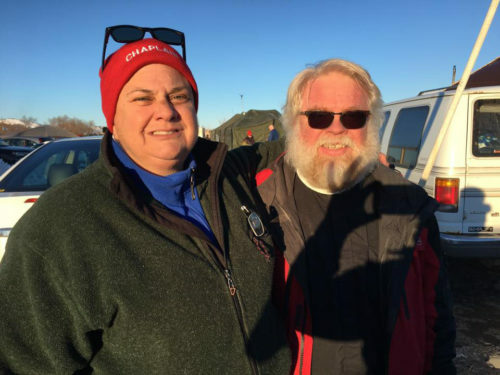 [Episcopal News Service] Episcopal and interfaith chaplains were about to raise a tent in the Oceti Sakowin Camp on Dec. 4 when a message runner approached and called them to join the crowd already gathering around the sacred fire in the camp’s center. They left the tent, poles inserted, on the ground, and they went. As they joined the hundreds of people around the fire, Standing Rock Sioux Tribal Chairman Dave Archambault II took to the microphone to announce that that federal government said it would not allow the Dakota Access Pipeline to cross under the Missouri River at Lake Oahe, the drinking water source for some 8,000 people living on the Standing Rock Reservation, which covers 2.3 million acres in North and South Dakota. He called on those present to take the lessons learned from the “Water is Life” movement home with them to heal their families and communities, and to create a better future. “It’s time that we now move forward and that we don’t forget. I’m just so thankful for all of you,” Archambault said. The crowd, including many who have been camped out in opposition to the controversial oil pipeline for months, erupted into applause; tears flowed, and people hugged one another in celebration. Thousands of people, including Native Americans and indigenous people representing some 300 tribes from around the world, have traveled to North Dakota in recent months in an unprecedented show of solidarity with the Standing Rock Sioux Nation. “On behalf of the Episcopal Church, I offer my gratitude to President Barack Obama and his administration for championing the rights of the indigenous peoples of the United States. We applaud the decision by the U.S. Army Corps of Engineers to deny the pipeline permit under Lake Oahe,” said Presiding Bishop Michael Curry, who went to Standing Rock in September. “I personally offer thanks to all those who have worked to amplify the voices of the people at Standing Rock, calling our attention to historic wrongs and injustices, and urging us all to consider a new vision for how we might love God, love each other and love creation. The Dec. 4 decision came as U.S. military veterans were pouring into the camp to stand as a shield between nonviolent water protectors and law enforcement officers in what had become an increasingly violent, militarized standoff. At one point, it looked as if protectors would be forced to evacuate the Oceti Sakowin Camp, located on federal land just south of the Cannonball River on Highway 1806. The Standing Rock Sioux Tribe commended the Obama administration and the federal government for its decision. The U.S. Army Corps of Engineers launched a review of the permit on Sept. 9, when it requested construction stop on the 1,172-mile 30-inch diameter pipeline poised to carry up to 570,000 gallons of oil a day from the Bakken oil field in northwestern North Dakota – through South Dakota and Iowa – to Illinois where it will be shipped to refineries. The pipeline was to pass within one-half mile of the Standing Rock Sioux Reservation and tribal leaders repeatedly expressed concerns over the potential for an oil spill that would damage the reservation’s water supply, and the threat the pipeline posed to sacred sites and treaty rights. Back in September, federal agencies said the case highlighted the need for discussion regarding nationwide reform with respect to considering tribes’ views on infrastructure projects. President-elect Donald J. Trump says he supports the pipeline’s completion. 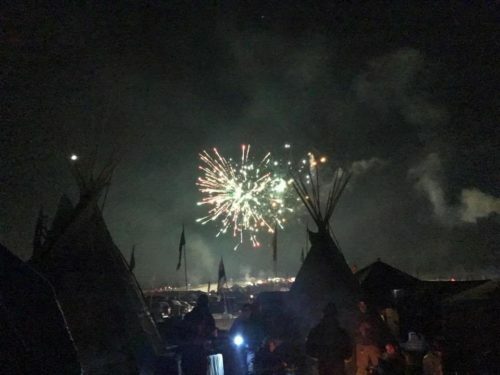 Even while celebrating the Dec. 4 victory, water protectors and their allies are preparing for the long winter and road ahead. Although the Dec. 4 decision is a victory, the case is not over. On Nov. 15, Dallas, Texas-based Energy Transfer Partners, the company developing the pipeline, filed a lawsuit asking for federal court intervention to finish the project. 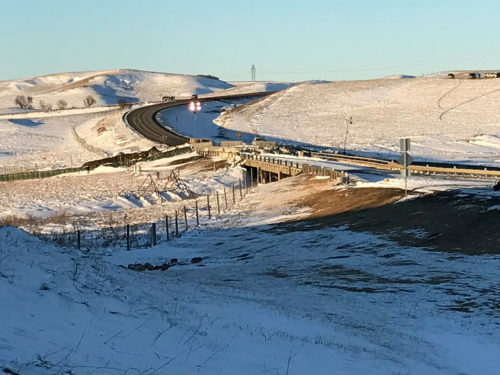 The situation on the ground intensified in late November, and initially, the U.S. Army Corps of Engineers and the Morton County Sheriff called for the evacuation of the Oceti Sakowin Camp, but both have since backed off. The Dec. 5 evacuation deadline coincided with the planned “deployment” of military veterans on the ground. In anticipation of the veterans’ arrival, the Standing Rock Sioux Nation asked for chaplains to be present. 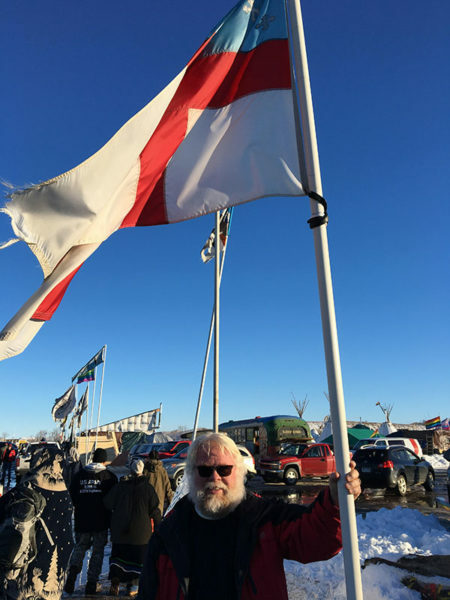 After the Dec. 4 announcement and the initial celebration the Episcopal and interfaith chaplains returned to erect their tent, and early on the morning of Dec. 5, they hit the ground running, providing wellness and pastoral care to water protectors and their allies in the Oceti Sakowin Camp. “We’re going two-by-two knocking on tents to make sure people are warm enough; if they are not we can help them get to a warming place, we have hand warmers and blankets,” said the Rev. Michael Pipkin, a former Navy chaplain on the Minnesota diocesan staff, who is coordinating the chaplain’s response. Temperatures were in the lower teens on the morning of Dec. 5, and by noon snow was falling. Temperatures are forecast to fall as the week goes on. “We all understand that this is a prayerful place, Oceti Camp is a camp of prayer. In my whole life, I’ve never been around so many people praying and praying for a single cause … this is prayer in action and prayerful action all at the same time,” he said. Thirty chaplains, including Episcopalians, Unitarians, Quakers, hospital and prison chaplains, are spending their days in camp through Dec. 7, while sleeping on the floor of St. James’ Episcopal Church in nearby Cannon Ball. On the evening of Dec. 4, Pipkin said, there was a line of veterans from recent and past conflicts still waiting to get into the camp. 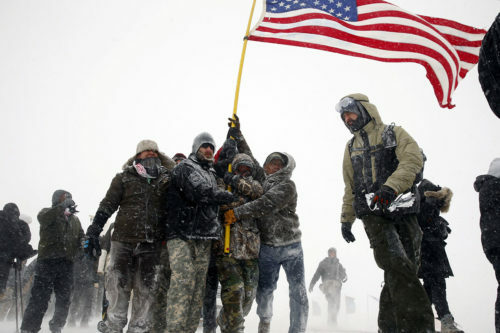 Also on Dec. 5, during a forgiveness ceremony held in the pavilion of the Prairie Knights Casino and Resort on the Standing Rock reservation, non-native veterans including Wesley Clark Jr., son of the retired U.S. Army General, knelt for 14 minutes asking elders for the forgiveness of sins committed by the U.S. government against Native Americans. Following the ceremony, Native American veterans were asked to come forward and make relationships with those who were apologizing, and they did so by exchanging hugs and handshakes, said Stanley. The Episcopal Church has supported water protectors and their allies since August when opposition to the Dakota Access Pipeline began in earnest. And the support will continue, said Floberg. The Church will continue to provide support comfort and pastoral care to people on the ground, and Floberg is encouraging Episcopalians to continue to come to Standing Rock in a show of solidarity; yesterday as the announcement was made, a group from Rochester, New York, was making its way. — Lynette Wilson is an editor/reporter for Episcopal News Service. The Rev. Lauren Stanley contributed reporting from the ground in North Dakota. I’m glad that this was passed and that cooler heads prevailed. Both sides were not totally innocent during this entire ordeal but am glad that God gave enough common sense to all involved. Now, can we as a nation PLEASE, PLEASE, PLEASE, start some sort of reconciling. I voted for Hillary but you will never see me out in the streets destroying property just because Trump won. Why? Because I know that ultimately GOD is in control. Always has been and always will be. Blessings upon the Sioux nation. The struggle is far from over. As we know, a pro-pipeline Administration is about to take over. In the meantime, it seems to me that it is the pipeline company, Energy Transfer Partners, that is breaking the law, by thumbing its nose at Sunday’s decision, and that the panoply of “law enforcement” north of the bridge is now protecting the law breakers and disadvantaging the Native American water protectors peacefully assembled on their own land. How is the fire and the land and water sacred to those of us who are Christians? I can see defending the Native Americans on environmental grounds but I don’t see why we have to support pagan beliefs–especially with so many Christians being persecuted and killed in other places. Fire and land and water are of God’s creation, according to most people of faith, therefore sacred. We support on those grounds, and on the grounds that we are to love and support our neighbors regardless of faith. (That was the point of Jesus’ story about the Good Samaritan, after all.) Do you really know the nature of their beliefs enough to make such a dismissive judgement? Is it our job to judge how one sees and worships the Creator? God is called by many names and is big enough to be worshiped in many different ways. And for the record, there are hundreds of Christians, Jews and Muslims alongside these native peoples. I thought “The Episcopal Church welcomes you” applied to everybody? God does things in mysterious ways. I have stopped trying to second guess God since I was a kid. This project is not over yet. Stand-by to stand-by while another administration takes over. Stay with the prayers. A temporary Marxist, ecofascist, shamanistic victory over logic, reason and common sense. The pipeline will ultimately be completed, energy will be created and economic progress will continue for the good of our great nation. I agree with Richard McClellan. This is a mindset with some in the Episcopal Church that doesn’t make me feel very welcome. I’m a newer member of the Episcopal Church and my only concern with it is when politics intervene. I don’t think Jesus would take sides. The baptism vows are to treat all with dignity and respect, I don’t find your comments to be either. Here, here. I will officially be received into TEC this upcoming Feb and I agree. Jesus welcomes all and we are to do the same as well. The ground is indeed level at the foot of the Cross. Blessings. Actually, it will now be April.